Mina Mooney's parents are killing her social life. It's time to fight back. . .
Mina's fantasy has finally come true. Craig Simpson--the hottest guy at Del Rio Bay High--has just invited her to the biggest bash of the year. There's just one hitch: her parents aren't down with letting Mina date a boy they know nothing about. Now she has thirteen days to give her parents a crash course in Craig, or else figure out how to get her fine self to the soiree--without alerting mom and pops. Whatever she decides, she's going to need reinforcements. . . Unfortunately, her peeps are caught up in their own twists and turns. 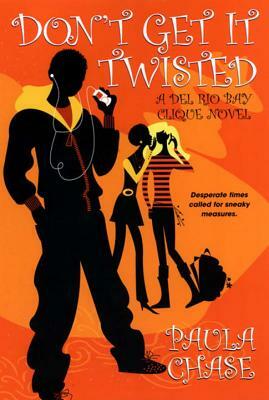 Jacinta's boyfriend has been getting on her nerves about spending so much time in 'burbville, while rich and sheltered Kelly just might kick it with Angel, a cute, slick-talking hustler from the projects. And ever since JZ made varsity basketball, his mind has been glued to the game instead of schoolwork, which means his dad might make him drop all sports. As for Mina, if she doesn't succeed in enlisting the help of her friends--and fast--her social life just might hit skid row. . .
A fast-paced novel about loyalty, love, and friendship, Don't Get It Twisted shows what it takes to have a blast while breaking all the rules. . .
Paula Chase Hyman lives in Maryland with her husband and two daughters. A former competitive cheer coach, her writing has appeared in Girls' Life, Sweet 16, and Upscale magazine. She's a founding member of The Brown Bookshelf, a national initiative dedicated to spotlighting African American children's lit authors flying under the radar.